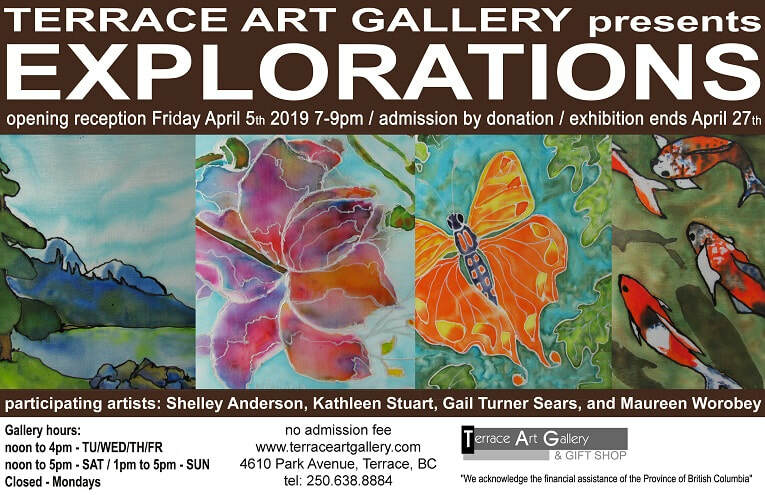 An invitation to all for our group exhibition opening at the Terrace Art Gallery on Friday April 5th, 2019. Shelley, Gail Maureen and I had a lot of fun with preparations for this show as we explored places and "new to us" art in various forms. As artists, it is often easy to work within our comfort zones - using the same familiar materials and styles to produce our imagery. For this exhibition we each moved out of our comfort zones to explore our creativity. 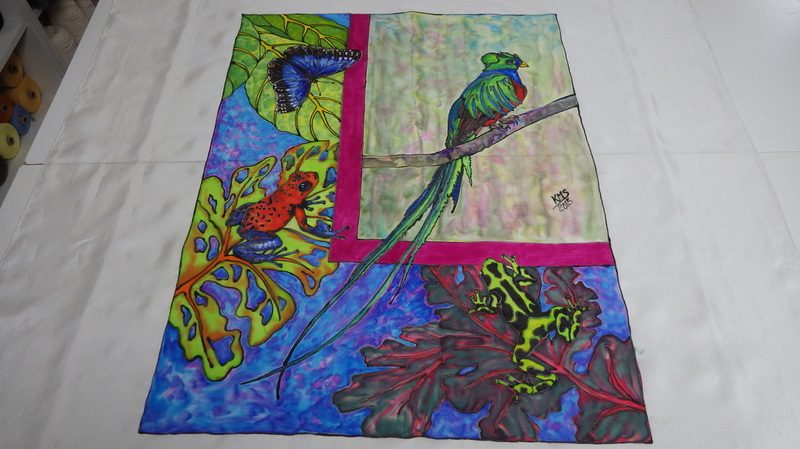 The art work reproduced on the invitation is from the paintings on silk that we each created in our own styles. For Shelley, Gail and Maureen applying gutta and painting using silk dyes was a brand new experience and for me it was a delight to share this painting technique with my friends. 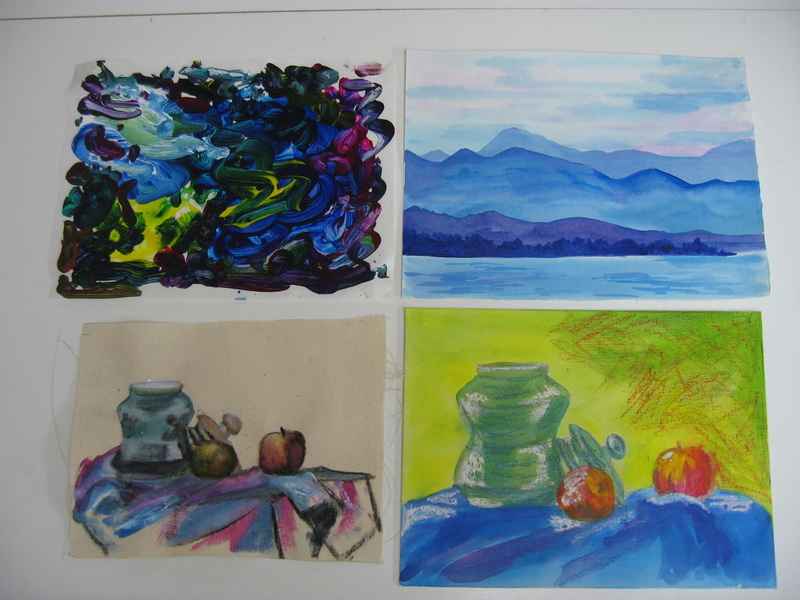 The images are cropped for the invitation so here are the individual paintings. 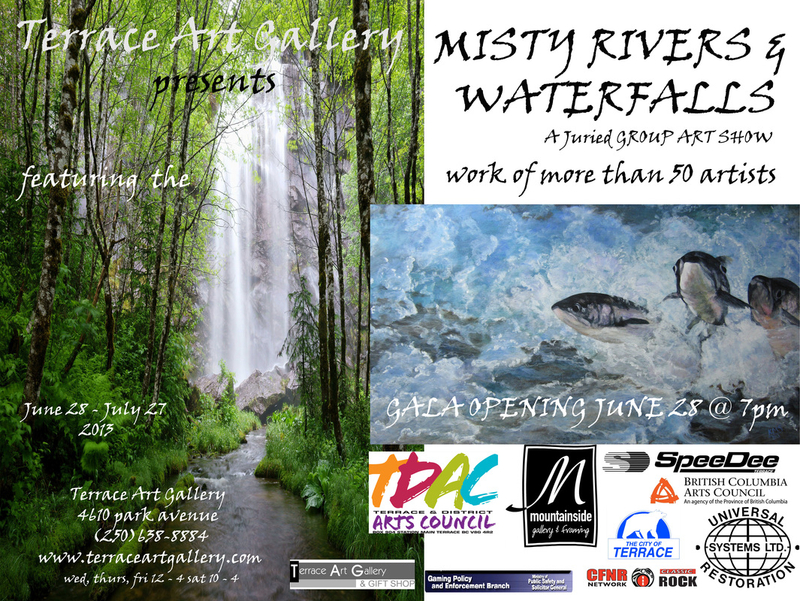 Hope to see you in the evening on April 5th at the Terrace Art Gallery! 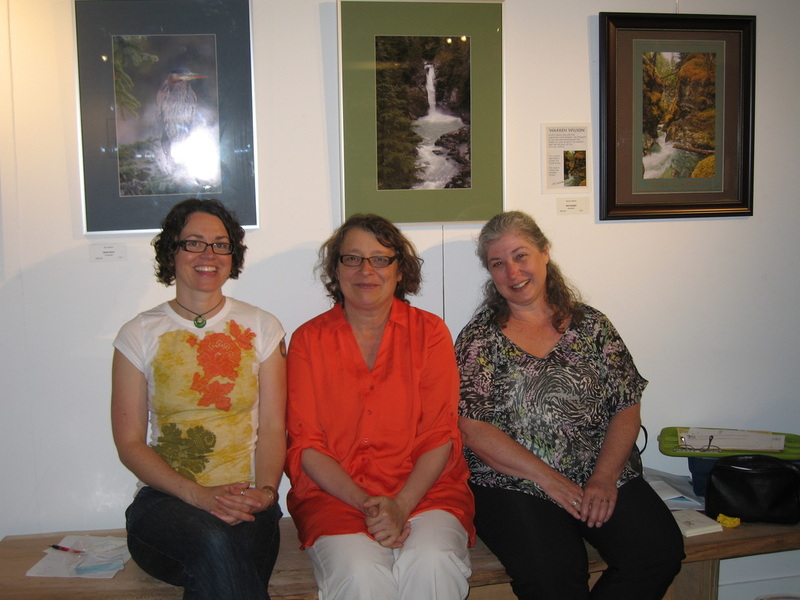 Our group show "Better Together" opened in Smithers Art Gallery yesterday. 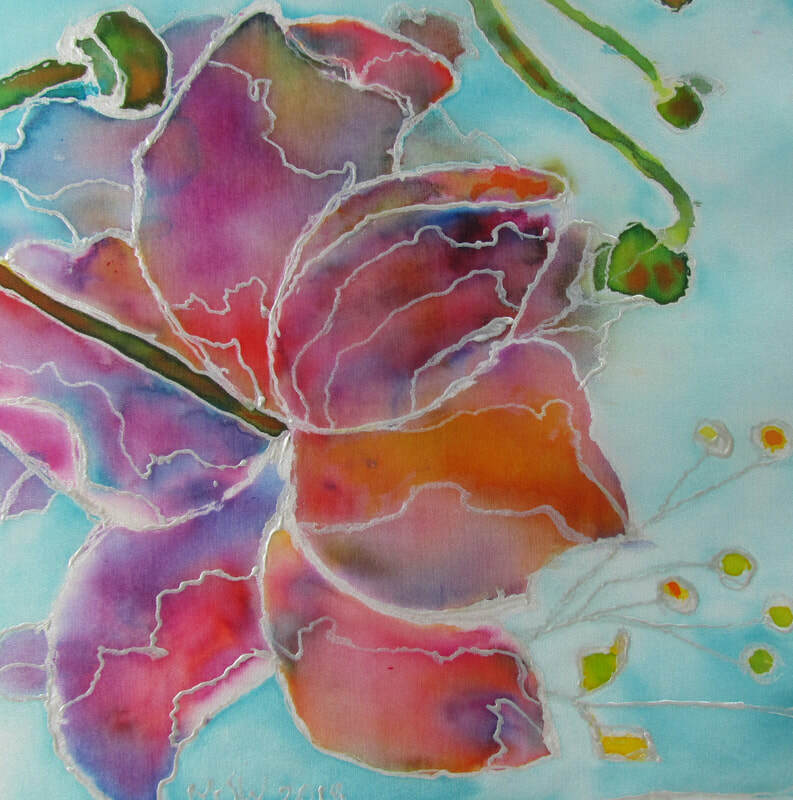 It features paintings paired with haiku poems by Gail Turner Sears, Joan Billey, Dyan Myhr and Kathleen Stuart. For those who can't join us at the artists' reception on Friday March 9, I have put a slide show together of my paintings and their haiku. Enjoy! On March 6, 2018, the exhibition "Better Together " opens at the Smithers Art Gallery (www.smithersart.org). 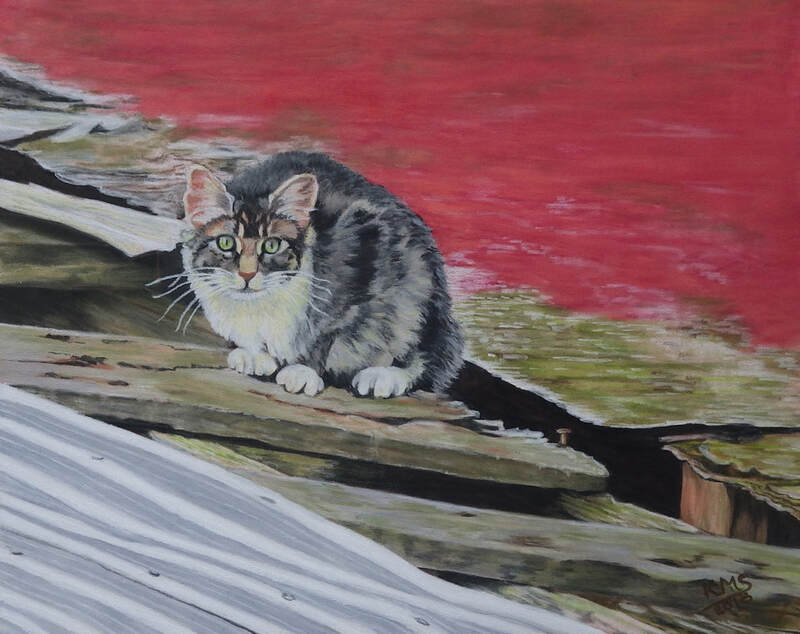 It features paintings and haiku by four women artists: Joan Billey, Dyan Myhr, Gail Turner Sears and me (Kathleen Stuart). 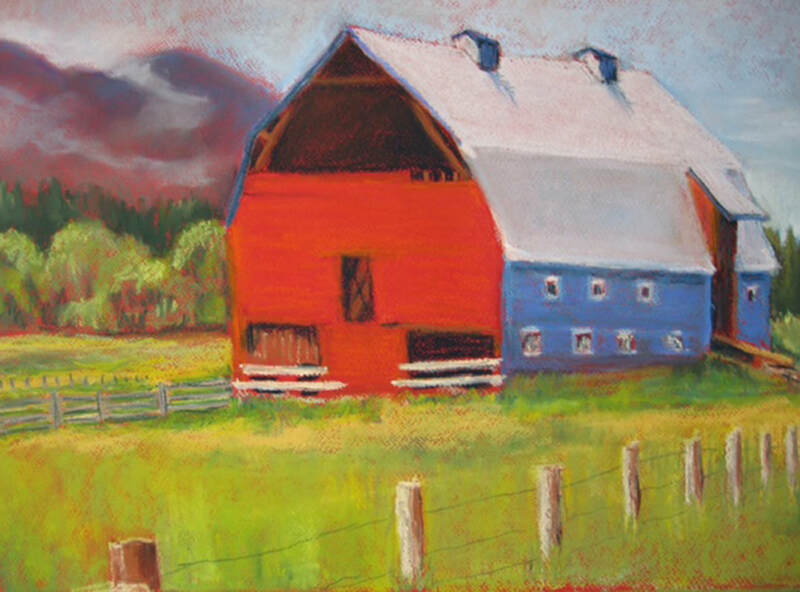 When Gail and I were talking about material for the show, Gail said she wanted to make a painting of the gorgeous old barn on the highway west of Smithers. I am always ready for a road trip, so one sunny day late last summer we headed east armed with cameras and sketch book. As we were taking photos of the back side of the barn, I spotted a beautiful cat step out from the old rafters onto the ragged hot tin roof and settle in to watching us. Serendipity! Lots of great shots of the cat through the telephoto lens while Gail photographed the front of the barn. After lunch in Smithers, we returned west to take more photos of the barn as the shadows developed - no cat! 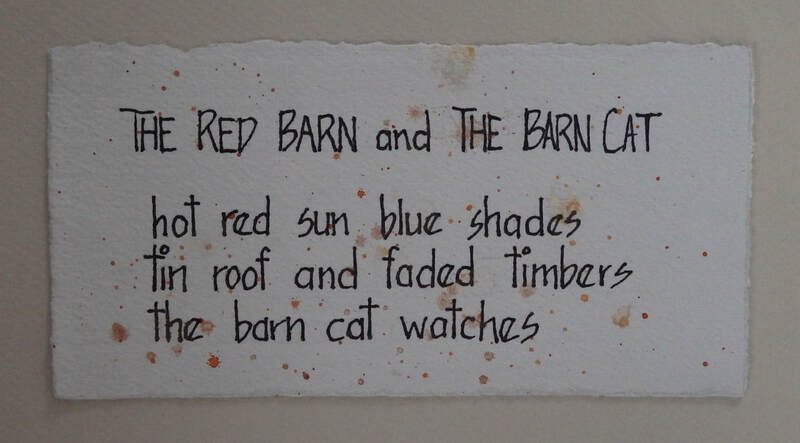 Gail painted "The Red Barn" and I painted "The Barn Cat", both in soft pastels, and we shared the haiku - definitely better together. 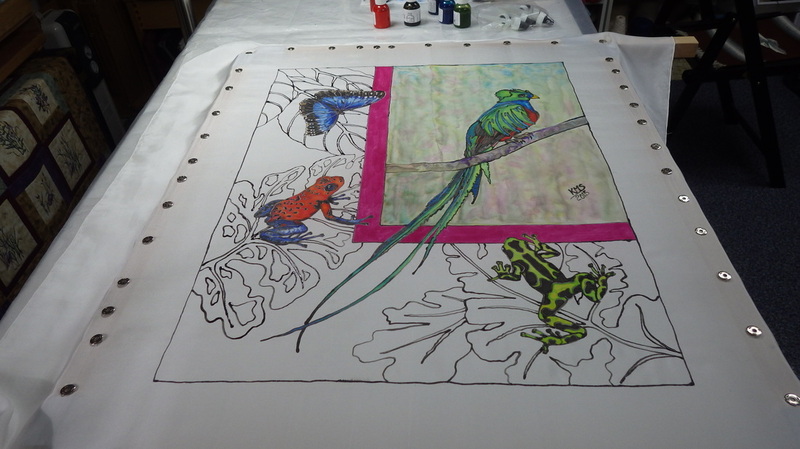 I've had a lot of interest and questions about my silk painting in the Terrace Art Gallery show so thought I could share the making of this piece on-line. 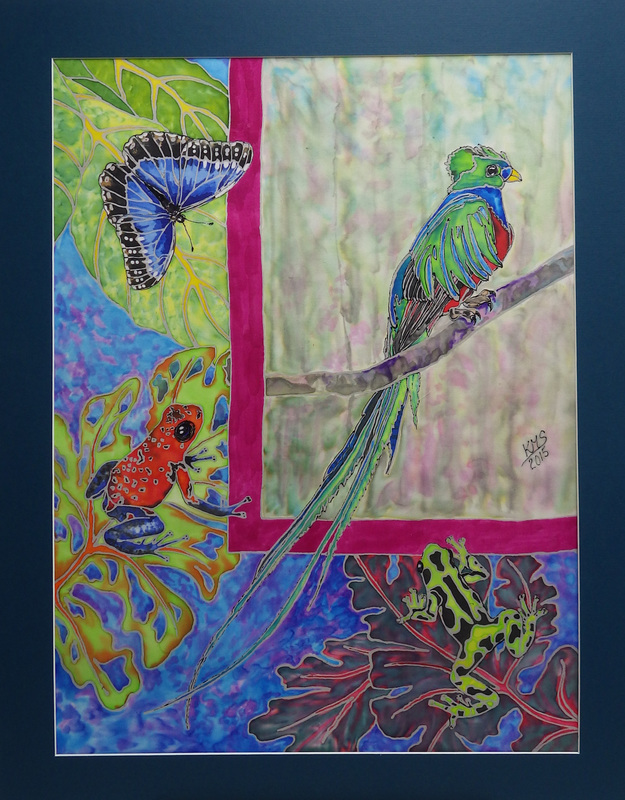 Blue Morpho, Poison Dart Frogs and the Resplendant Quetzal began life as several watercolour paintings but I couldn't capture the iridescent colours as I saw them in Costa Rica. 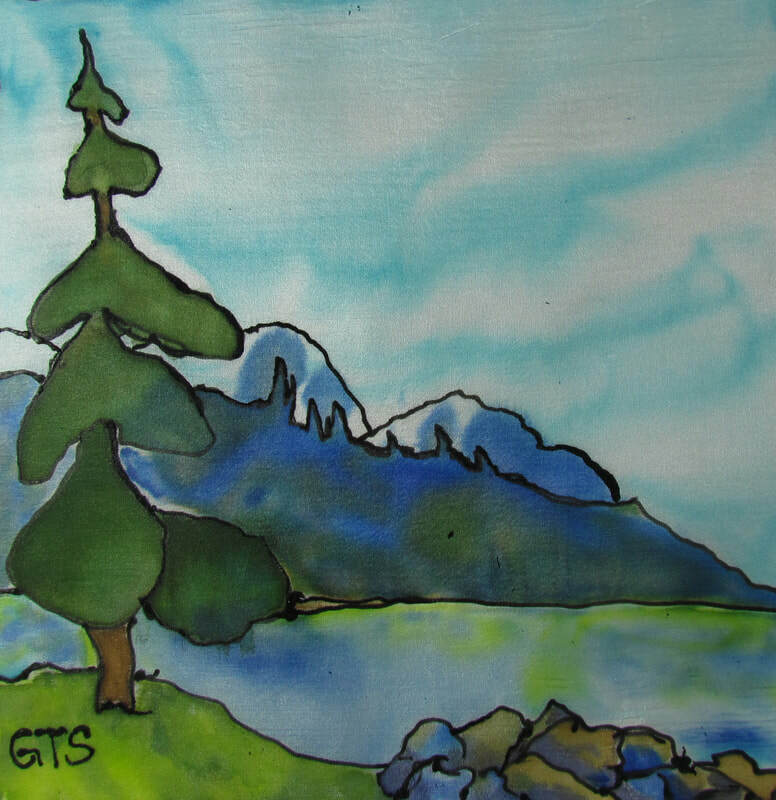 I had just purchased a sampler set of water-based G&S Liquid Colours after watching silk artist Jean Batiste videos so decided to play with the new products. 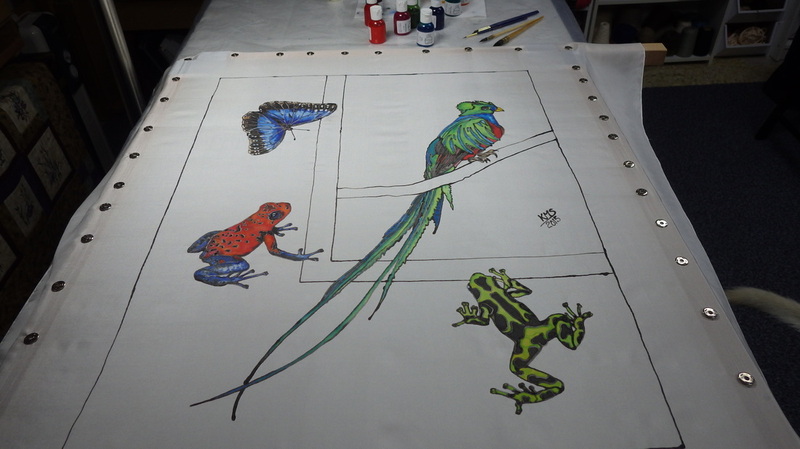 I usually use silk artist Leonard Thompson's technique of "hidden" gutta lines in my silk paintings but tried Jean Baptiste's acetate cones to apply a coloured resist. 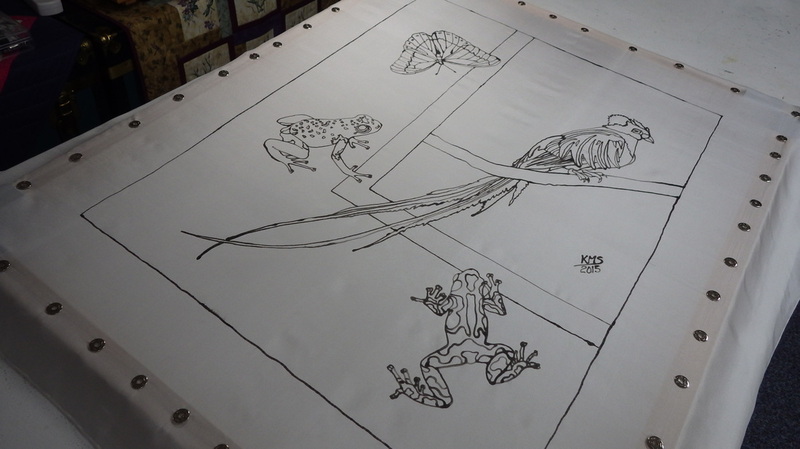 I mixed up the water based resist, added black Liquid Colour, got a nice flowing consistency and got to work simplifying my sketches directly on the silk with the resist. The cones when I figured out how to vary the size of the openings work very well and are very kind for arthritic hands! At this point I am happy with the design and added pure and diluted colours. Everything seems to be going well, no big splotches and resist lines are holding nicely. After a day of toying with different layouts for the backgrounds, I choose my sketch and use the same black water-based resist. I continue on, playing with Jean Baptiste's shimmering light technique until I am finished painting. 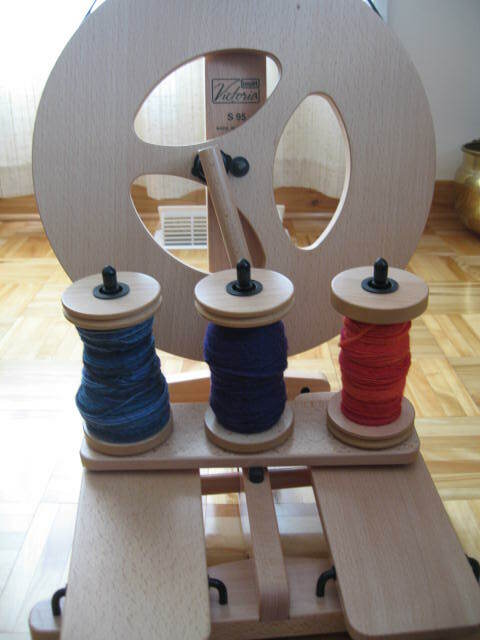 The Liquid Colours are fixed with a warm iron, no fussing for hours with a steamer, then G&S Dyes recommend waiting a few days before washing to retain colour brightness. I cannot begin to tell you my dismay when I washed the silk and saw the black in the resist float off into the water! All those hours gone in 2minutes in the wash! BUT I ironed the silk, looked at the lovely soft grey resist lines and liked the finished piece better than with the heavier black lines I had planned! I am delighted to say that the piece sold at the opening reception and is off to a new home when the show closes on Saturday October 24. And two lessons learned: 1) read instructions before using new materials [I should have substituted black Liquid Colour for water in mixing the resist, not added black to water mixed resist] and 2) accidental experiments can be very rewarding! 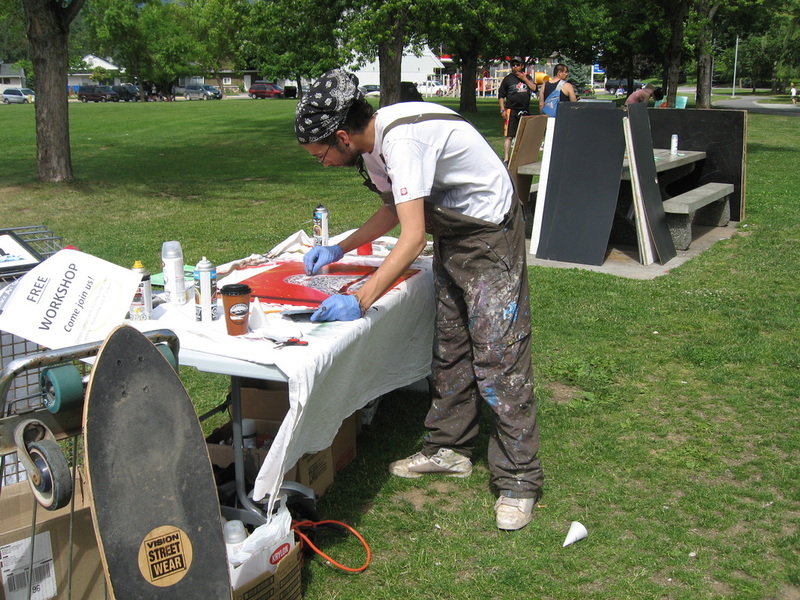 You can see the rest of my pieces in Places Near and Far on my Picasa public site. 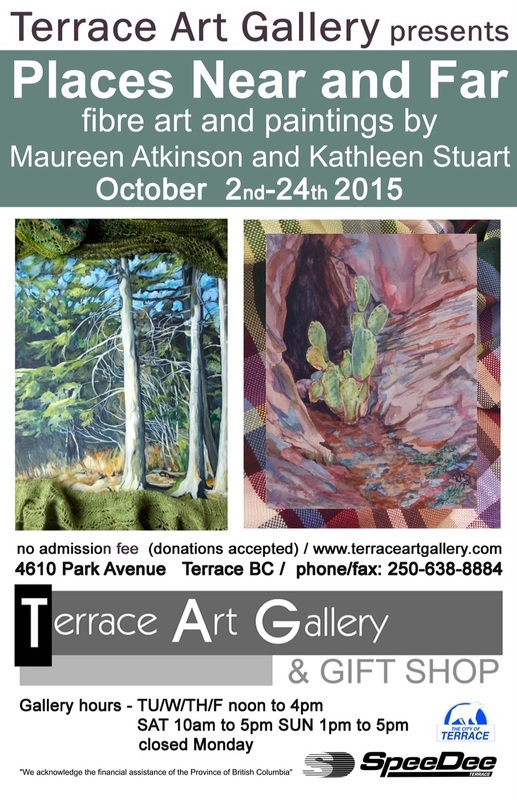 The opening reception is on Friday October 2 from 7-9pm at the Terrace Art Gallery, 4610 Park Avenue in Terrace, British Columbia. After spending most of 2014 travelling and painting and much of 2015 in the studio with some travel time, Maureen and I are delighted to invite you to see our new show of fibre art and paintings. 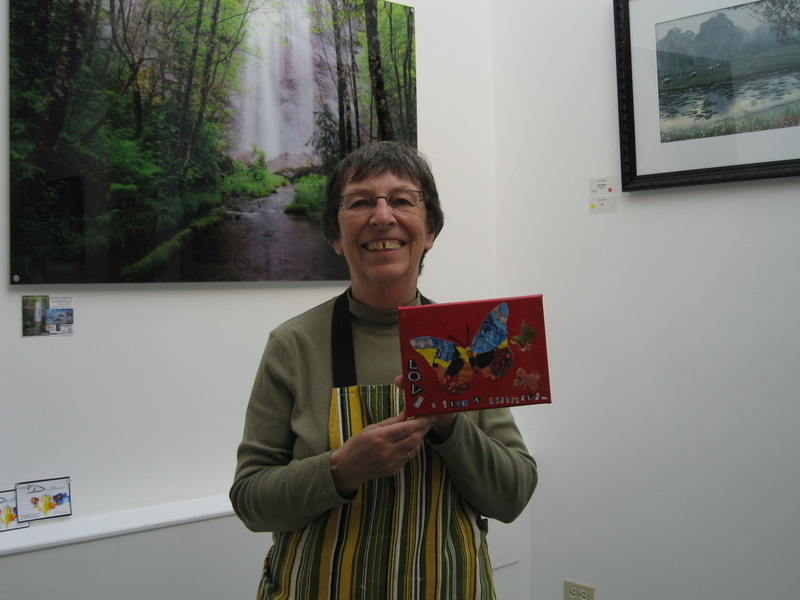 The upper gallery is filled with paintings of places near to our homes in north western British Columbia. 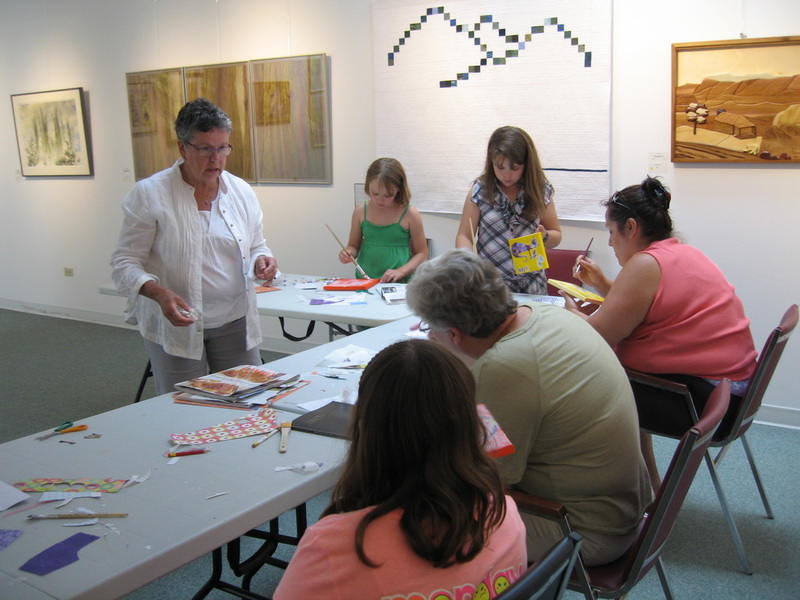 The lower gallery visits Newfoundland and Labrador, the U.S.A., Costa Rica, Europe and India. 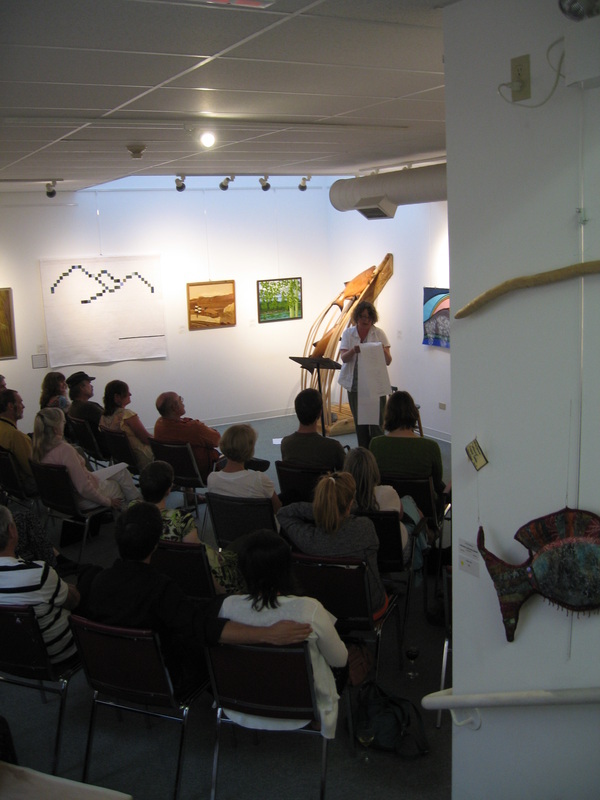 All of the paintings in the show are complemented by fibre art. The poster shows Maureen's painting of Opheim Way in Kitimat edged with her knitted fibre pieces and my painting Canyon Cactus in Sedona, Arizona is edged with a handwoven cotton blanket. 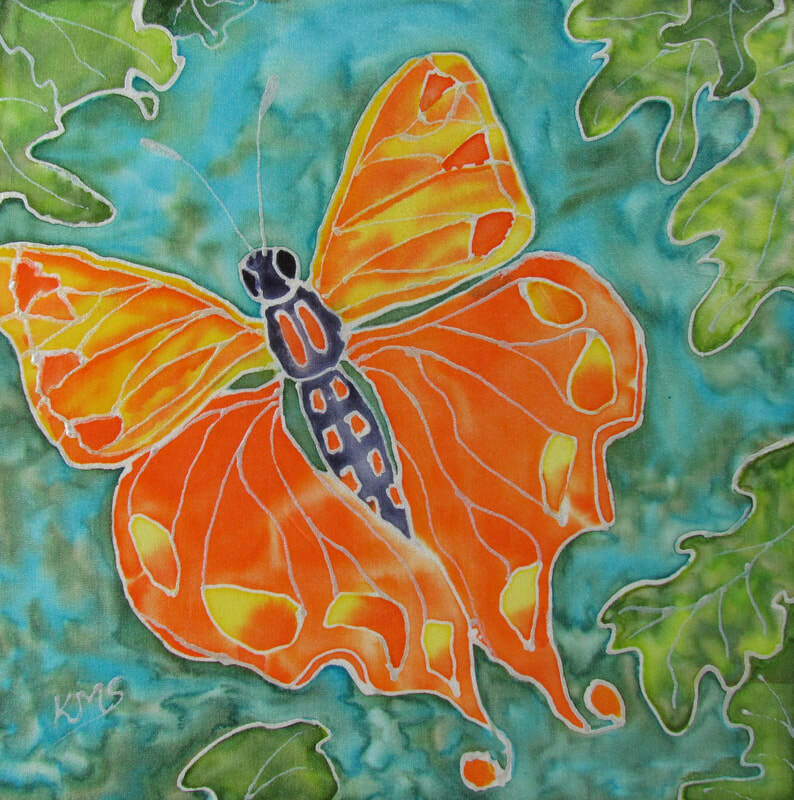 We hope you can join us at the reception or take in the show between October 2nd-24th 2015. 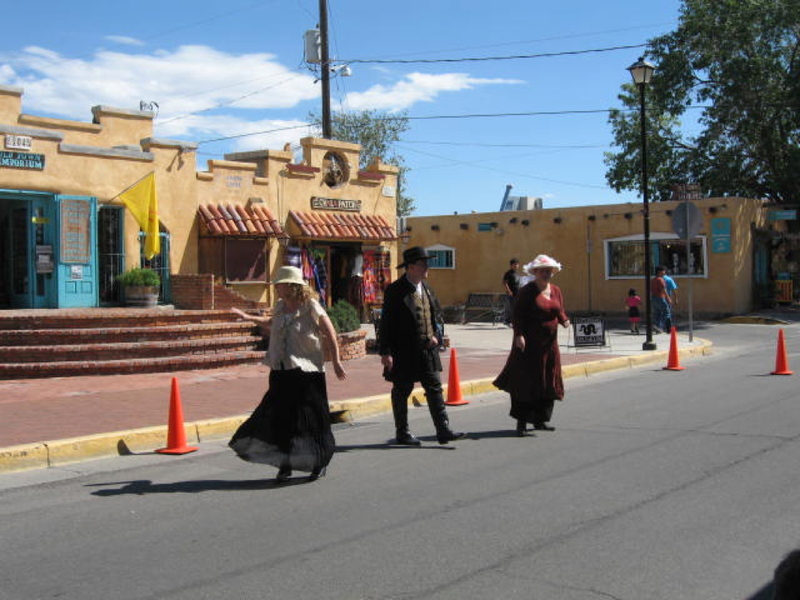 A trip to New Mexico would not be complete without some time in Albuquerque&apos;s Old Town. The plazas are full of galleries and shops with beautiful artworks, pottery and of course jewelry. One of my favorite yarn stores is in Old Town. 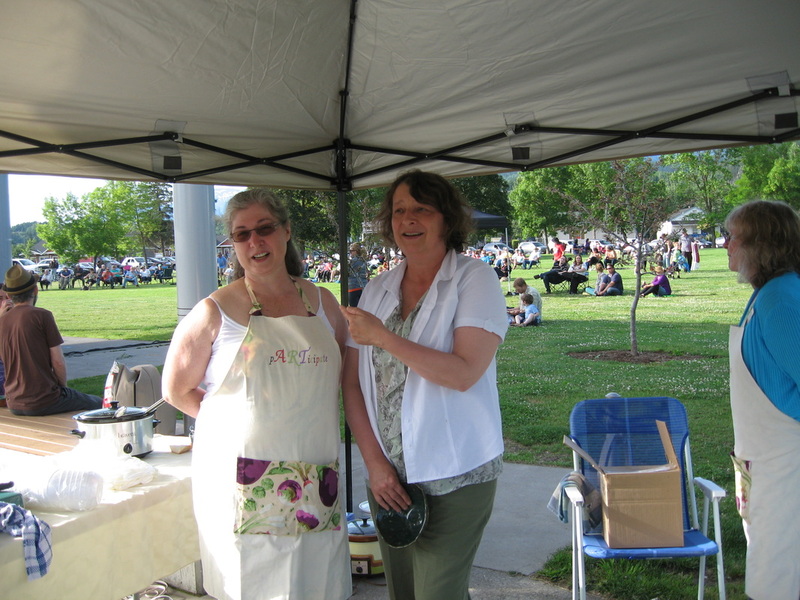 Fiber Chicks is owned and operated by Lesley Miller and she is a truly innovative knitter/designer/teacher who loves to share. 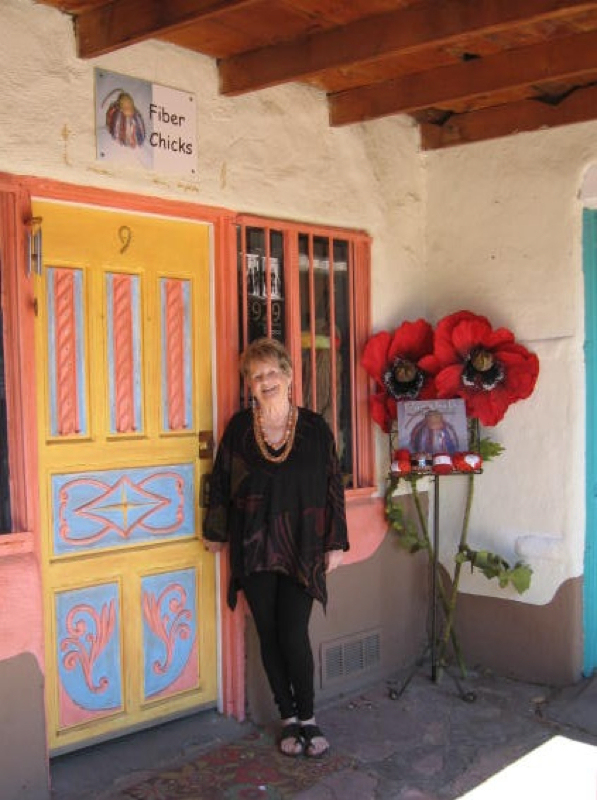 Here she is at her shop entrance and check out those red fibre flowers. 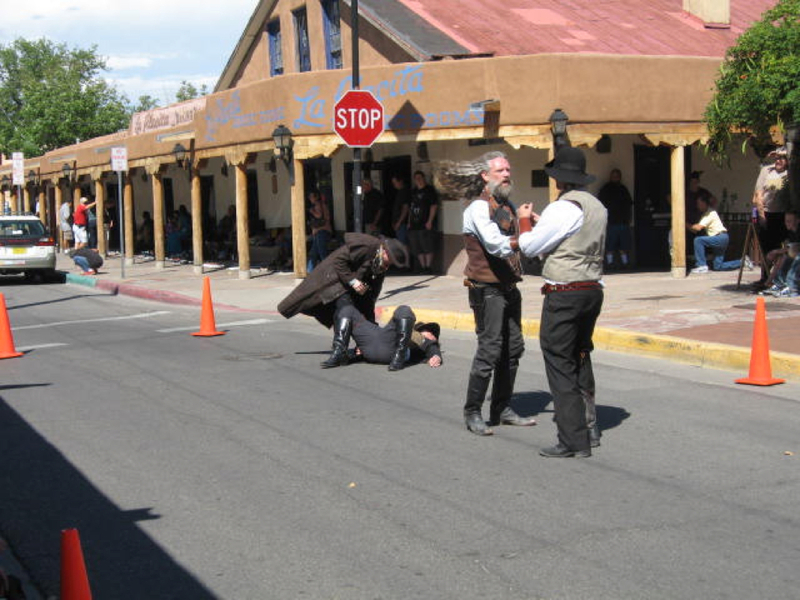 On my way to the Rattlesnake Museum, another Old Town favourite, I took a step back in time as I watched the New Mexico Gunfighters representation of a shoot-out! 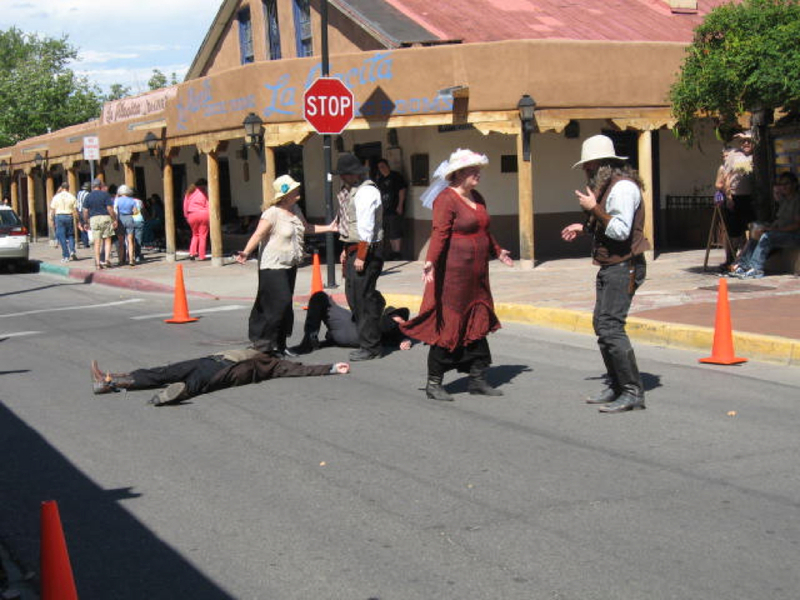 Great street entertainment with elements of historic accuracy. At the Easel - I completed a little oil painting of a restored 1947 Chevrolet for a very proud owner. It was a challenge to paint metallic reflections and something completely out of the box for me but I really enjoyed working on it. I learned that I should have a very, very smooth surface to really nail down the chrome reflections but overall I was pleased with the result. I wove a car blanket to show with the car painting in the Terrace Art Gallery's Members Exhibition - a long trip in a '47 Chevy would not be complete without a warm car blanket, especially in northern B.C. For the Terrace Art Gallery's fundraiser 6"x6" Auction on September 26 I painted the Usk Chapel found along Highway 16 east of Terrace. If you are in the Terrace area, do check out the incredible selection of 6"x6" framed canvases currently open for silent bidding. 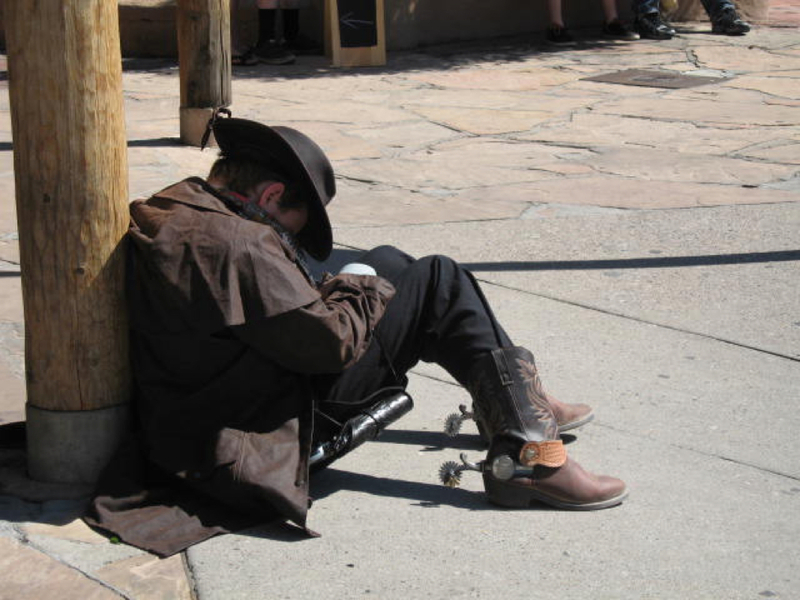 Unfortunately, I am on Roadscholar programs in New Mexico when the final auction takes place but I hope at least a couple of my bids will withstand the bidding wars from Gallery supporters. 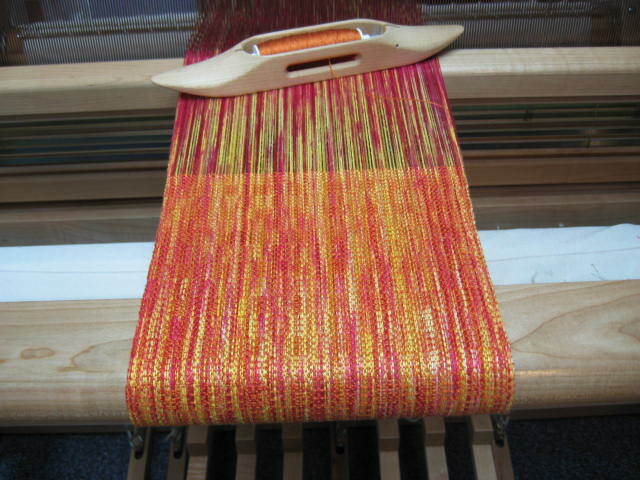 On the Loom - I went to a fibre painting workshop presented by Lucy Slykerman in late winter and painted a very long warp - enough for 8 silk-bamboo-tencel scarves. It was a bit of a grand experiment and fun-filled day! As you can see, I am not conservative in my colours and wanted to see if I could get 8 completely different scarf colourways out of the warp. 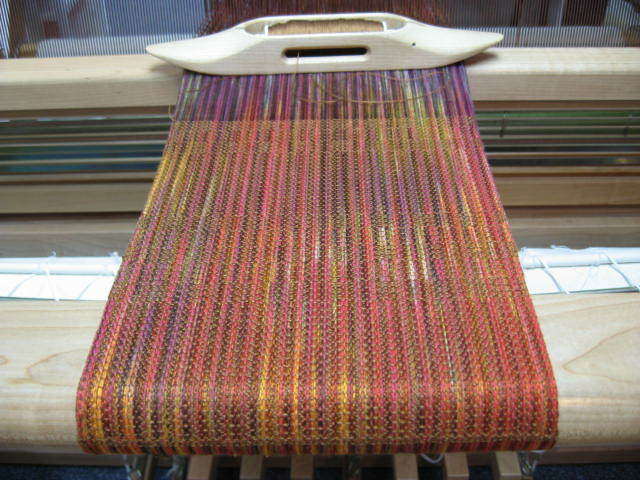 Here's the warp coil and each of the 8 scarves on the loom. 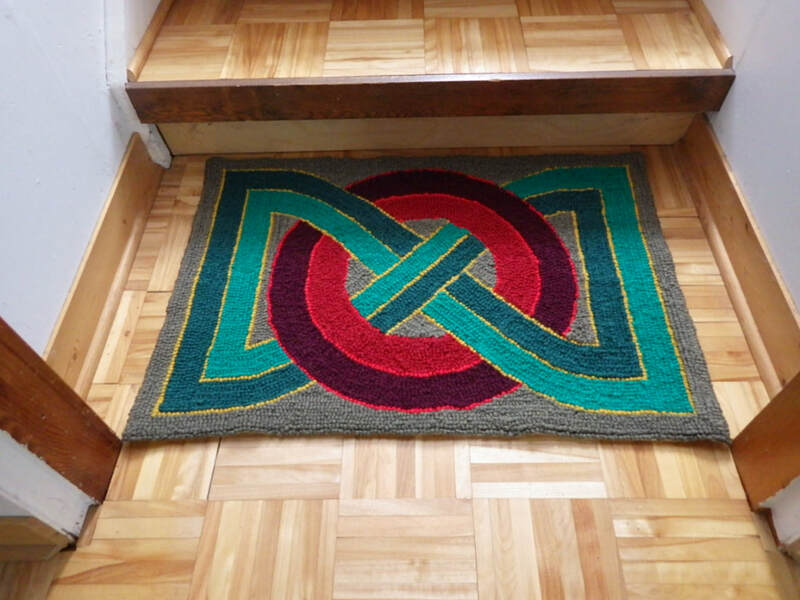 Hope they look good when they come off and there are no huge mistakes in the weaving! 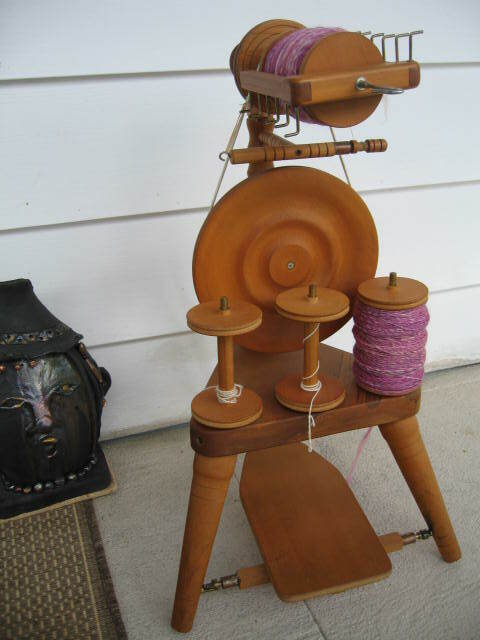 On the Wheel - Bobbins almost full on both treadle wheels so time to ply. Nothing quite beats sitting spinning on the porch in the late evening as the sun sets. 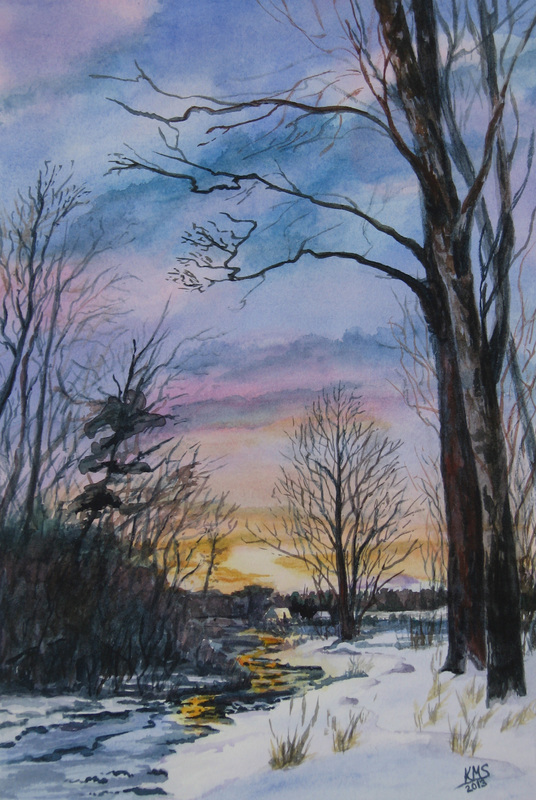 And have we had some fabulous sunsets in the past couple of weeks! Off the Needles - My knitting project for travelling! Easy pattern fingerless mitts, short yardage, light weight, fun colours, short wood needles for airport security and fits in my satchel pocket! On the Road - sketch book, paintbox, fibre, camera and binoculars are ready for the next learning adventure! 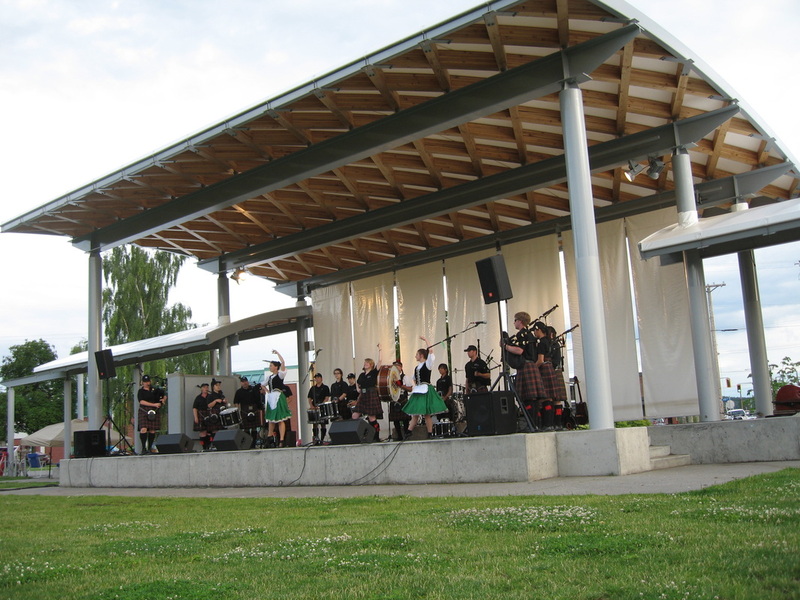 The 2013 Summer Arts Festival has been a wonderful beginning to summer days in northern British Columbia. Ten days filled with arts, music, film, poetry and workshops - all of it free and fun, fun, fun! 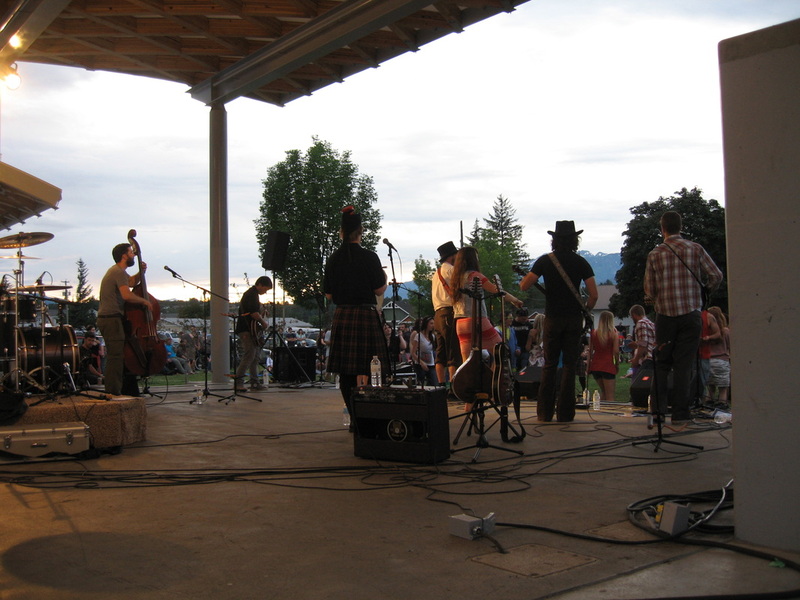 Thank you Terrace and District Arts Council for another fantastic festival! 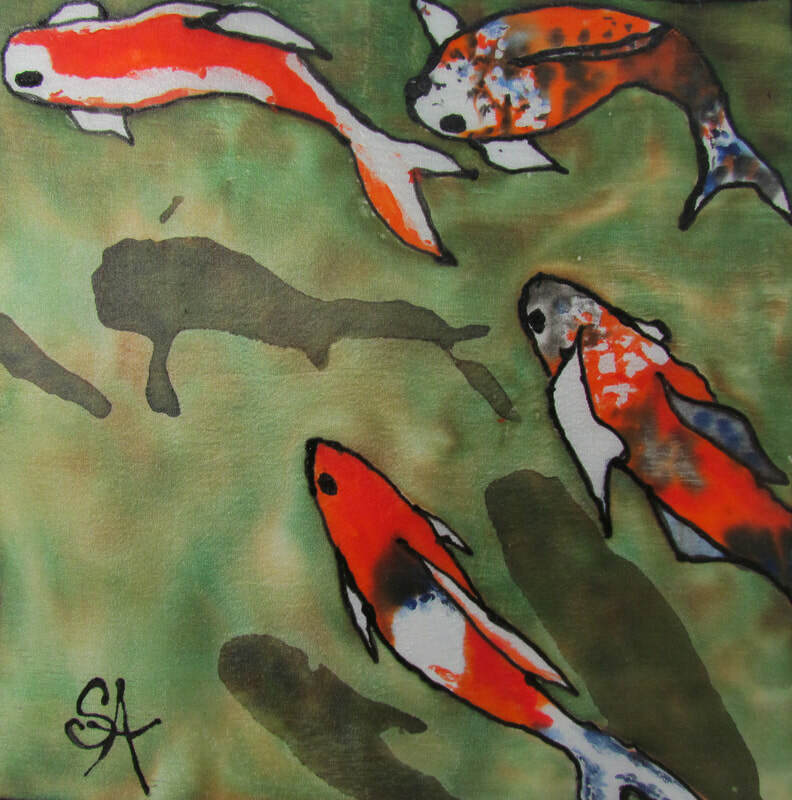 find both my paintings had red "sold" dots, my thanks to the buyers! Love is like a butterfly...my first collage! 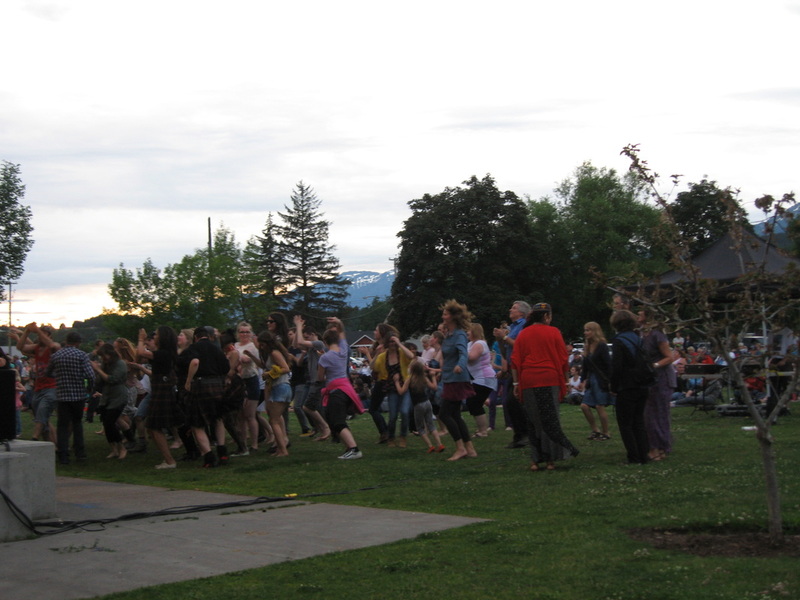 .....and Terrace danced as the sun began to set.